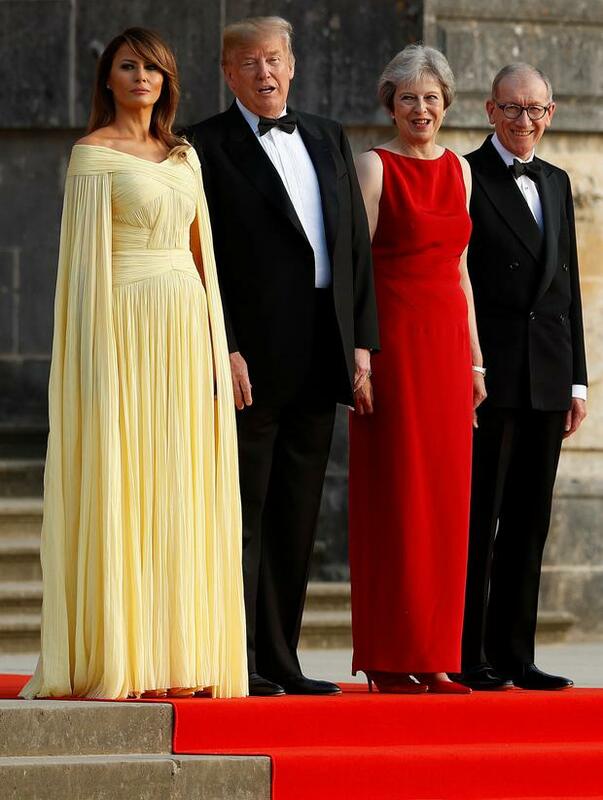 Donald Trump was booed and jeered as he was helicoptered out of Regent's Park to attend a black-tie dinner with Theresa May. Protesters shouted "shame on you", waved anti-Trump placards and banged on pots and pans as the US leader and his wife Melania were flown from Winfield House in London on Marine One. A large crowd gathered from the early evening to stage a noisy protest in the hope Mr Trump would hear them from behind a tall fence which has been erected around the perimeter of the US Ambassador's official residence. Demonstrators adopted an alternative version of England's World Cup anthem Three Lions as they sang and shouted: "He's going home, he's going home, he's going, Trump is going home." Bells and whistles rang out alongside cheers and claps for speakers throughout the protest. Placards including "Dump Trump" and "Trump not welcome" were held aloft by the enthusiastic crowd before some began banging on the metal fence, behind which stood a number of Metropolitan Police officers.A clip of what organisers said was the sound of children crying at the US border after being separated from their parents was played and described by those listening as "disgusting". 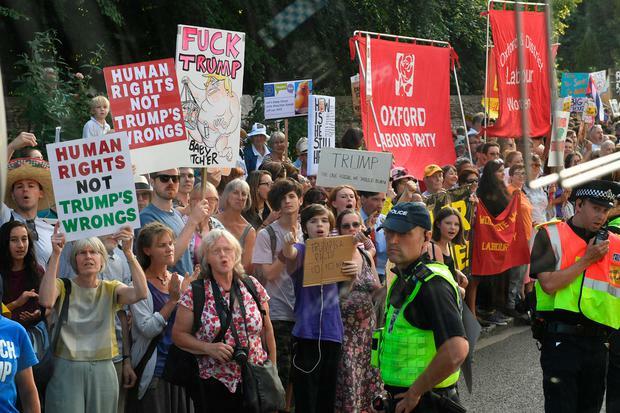 Earlier, Sam Fullerton from Oklahoma said while Mr Trump may not have seen the protest from Winfield House, which is set back inside the fenced-off area in the park, he hoped he would hear it or see it on television. Mr Fullerton said: "He watches a lot of TV so he'll see it on TV. Or they may be out in the backyard." His wife Jami, a Hillary Clinton supporter, said the protest was "democracy at its finest". "I'm here to witness democracy outside of our own country to see how other democratic societies express themselves," she said. "I think it's great. The British are pretty gentle people." John Rees, of the Stop The War group, described Mr Trump as a "wrecking ball" as he addressed those gathered. He said: "He's a wrecking ball for race relations, he's a wrecking ball for prosperity, he's a wrecking ball for women's rights, he's a wrecking ball for any peace and justice in this world and we have to stop him." Mr Rees said some of those gathered planned to stay for Mr Trump's return after the First Couple dine at Blenheim Palace with Mrs May.